HC-DSL series products are multiple-rate copper wire transmission device developed by Huachentel. Fully complied with ITU-T G.991.2 recommendation, and uses G.SHDSL.bis, TC-PAM digital modulation and echo cancel technology. 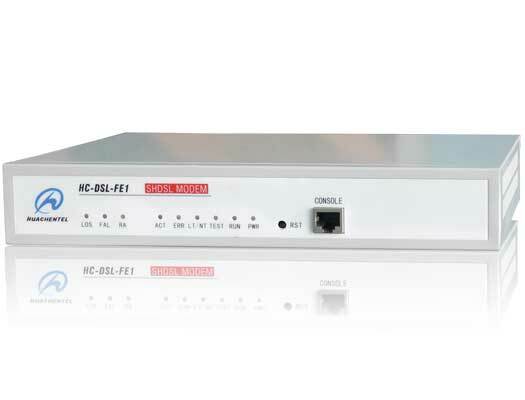 This series of products offers five different ways to connect customers over high-speed DSL services, with G.703/E1 (HC-DSL-FE1), Ethernet (HC-DSL-NB), V.35 (HC-DSL-V35), V.24 (HC-DSL-V24), and X.21 (HC-DSL-X21). Each of them has two kinds of type, card and stand-alone. For stand-alone devices, 2 or 4 wire G.SHDSL port is optional.Generally the cards are inserted in our 4U rack at the center side. They can be managed by the management software HCView at the center office, and detected the status and maintained from the HCView.